Hopefully, after reading Part 1, 2 and 3 of the Gut Microbiome Trilogy, you are now rethinking how to plan your meals in order to feed your gut microbiota (or those guys down there). Your gut microbiota is truly your partner in health. We know the gut microbiota communicates with the brain via the microbiome-gut-brain axis. This simply means that the microbiota can regulate our nervous system, hormones, endocrine system, and our immune system. Likewise, if we are not partnering and planning our meals for our guys down there, our fork can dysregulate these systems and create serious health problems. Mounting evidence shows that a high microbiota diversity (per Shannon Index) improves the communication between the microbiome-gut-brain axis with crystal clear clarity. What this clinically means is: lower inflammation, leaner body, controlled appetite, lower levels of depression and anxiety, increased learning, improved memory, improves social anxiety, helps regulate pain perception, improved blood sugar control, decrease cardiovascular risks…..should I go on? The research on using specific strains of probiotics to induce positive health results is just astounding. But make no mistake, seeding your gut with fermented foods that are rich in probiotics is a fantastic way to tell your partners-in-health down there that you care. Furthermore, to make those guys down there thrive and “feel your love” concentrate on prebiotic foods, beans, lentils, raw nuts and seeds, colorful vegetables and fruit, and whole grains. Also how you cook certain foods can make a big difference. Baking potatoes, yams, squash vs boiling them and allowing them to slightly cool before eating them will result in something called resistant starch. The resistant starch is a banquet for those guys down there. Are you getting the food picture yet? A microbiome rich diet consists of plant foods. These plant foods are full of fiber and phytochemicals. For the most part these by-pass our own digestion, travel pass the small intestines and become microbiome-accessible carbohydrates (MAC-diet). The microbiota will munch on these fibers and phytochemicals and produce many health-promoting by-products that regulate our appetite, pain perception, learning capacity, memory, anxiety, depression, and resiliency during stress, and even social anxiety. So if you want to lose weight and be the life of the party, think high MAC Diet. Place greens and with cut stems into a bowl with water. Rinse well and place on the side. With a vegetable brush scrub all root vegetables: beet, radish, carrot, fennel, turmeric, and ginger. Wash lemon with skin. Cut beet and carrot into fourths. Cut radish and lemon in half. Place all root vegetables and lemon in bottom of Vitamix, Nutribullet, or a very high speed blender. Add greens and stems on top. Add PaleoReds, almond butter, yogurt and SunWarrior Plus Vanilla. Fill with Unsweetened coconut almond milk to the top of the ingredients and blend on high for 4 minutes. Add frozen fruit and blend another 2 minutes. And coconut almond milk or water if you desire it to be thinner. 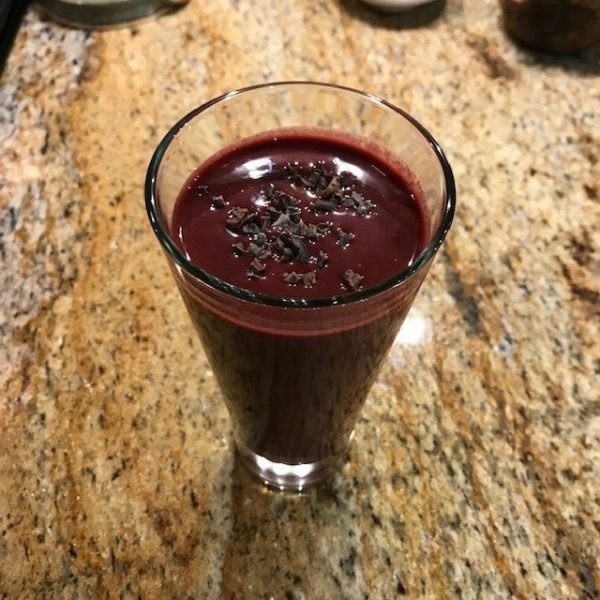 Add a handful of almonds and 1 tsp of organic cacao nibs then pulse so they stay chunky so it forces you to chew your smoothie for better digestion. FYI Digestion is activated with chewing. Top with organic cacao nibs. Try it for a meal for one week and see how your cravings change for the better. I have many clients using whole food smoothies that are having notable health gains while experiencing remarkable weight loss. So Dorignac’s has populated the aisles and produce department with some special items that you can use to make your first HIGH MAC Smoothie. Let me know what you think, how you feel and how much weight you lose. Feed your microbiota and gain health!